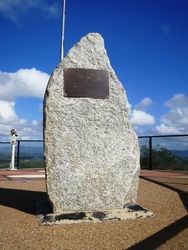 A monument commemorates Lieutenant James Cook, the crew of Endeavour and all mariners. Between 1763 - 1767, Cook`s Canadian surveys of the St Lawrence Channel, and the coasts of Newfoundland and Labrador, clearly demonstrated his skill for command and exploration. He was promoted to lieutenant and began preparations for his voyage of discovery aboard the Endeavour. In the following 3 years, Cook observed and recorded the transit of Venus at Tahiti, charted the coast of New Zealand, the east coast of Australia and part of the southern coast of New Guinea. The voyage through the Great Barrier Reef was challenging and dangerous. In June 1770, the Endeavour grounded on an uncharted reef. Cook beached the ship in the sheltered waters of what he later named the Endeavour River. Seven weeks later he and his crew continued their northward course.